(Lincoln City, Oregon) – An ethereal first is coming to the central Oregon coast. Lincoln City will hold its inaugural Solstice Lighted Parade on December 21, an illuminated parade on the beach with lanterns, flashlights, glow sticks, and all creative expressions of light – whatever you can bring. It's where public participation is requested – a radiant way of holding the grand finale of Lincoln City's 50th anniversary. 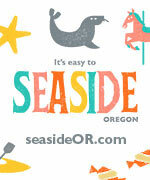 Participants will meet at the NW 40th Street beach access at Chinook Winds Casino Resort at 5:30 p.m. The parade route is a flat one-mile round-trip walk on the beach. The elements will not derail this party; the illuminated show will go on rain or shine. After the parade, participants and spectators can head to the Chinook Winds Casino Hotel for hot drinks, cake, treats, and prize drawings. Live music will also be provided. "This event is a new one that will be fun for everyone, young and old alike," said Sandy Gruber, Event Organizer for Lincoln City's 50th Celebration. "All we ask from participants is to make sure they bring along lights. Feel free to light up your hats, jackets, shoes, belts, umbrellas, or anything you can think of. We want to shine along the beach." To help you light up the beach, stop by the Lantern Decorating Party at the Community Center December 20 from 12:30 to 4:30 p.m. Buy a battery-powered lantern for just $5 and stay to decorate it your way. Decorating supplies will be provided and all proceeds from the party go to support the Youth Scholarship Fund. Fifty years ago, the small villages of Taft, Cutler City, Oceanlake, Delake, and Nelscott incorporated together into one town. The city charter was adopted in December 1964 and the first order of business was to find a name for the town. A heated debate amongst the residents ensued, but a creative solution tempered the controversy. A naming contest was held in 1965, and the name "Lincoln City" was chosen. Since then, Lincoln City has become an essential destination for multiple generations of visitors in the Pacific Northwest. For more information on the Solstice Lighted Parade, please contact Sandy Gruber at 541-994-5646. To learn more about Lincoln City, including its history, please visit www.oregoncoast.org. More about Lincoln City below (including many night photos) and at the Lincoln City Virtual Tour, Map.